We’ve all seen them: the spouse frantically texting from the aisles of the store trying to get instructions on exactly what kind of peanut butter to pick up. At Curbside we’ve lived this experience, and so we added a feature called Handoff. Handoff allows you to place exactly the order you want, and invite friends, family, roommates, whomever, to pick up for you. One person builds the Curbside pickup, the other grabs it. As always, it’s already paid for with no waiting in checkout lines or hunting in the aisles. It’s been very popular. A short time ago we were showing Handoff to our friends at Postmates and they gave us the lowdown on the very cool API they had in the works (announced today) that allows shopping apps to embed Postmates delivery. We got really excited because we saw Postmates delivery as a natural extension of our Handoff feature. Postmates loved the idea and invited us to be a launch partner for their API. 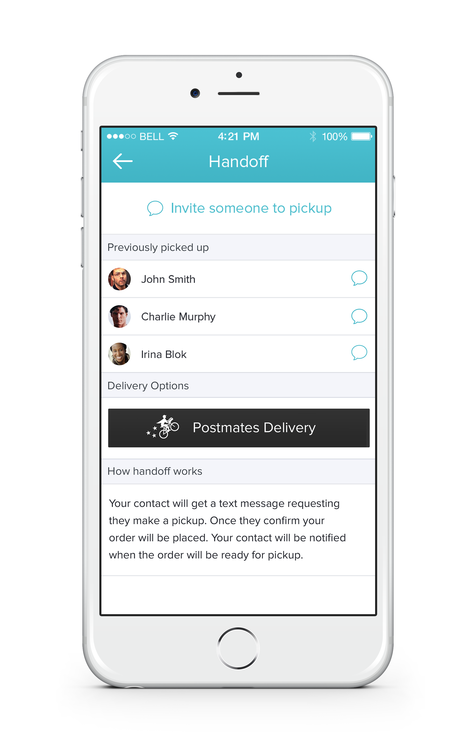 So today we’re announcing Handoff-to-Postmate. You can shop the Curbside app, tap Handoff on your cart, and choose the Postmates Delivery option. You’ll get a live quote on a delivery. Accept, and as soon as your order is ready a Postmate will go grab your order and bring it to you. This means you can use Curbside to get the exact products you need even on those days when you just can’t get out of the house. Awesome.